Son of Mataio (Matthew) Kekuanaoa and Kinau (daughter to Kamehameha I), Alexander Liholiho was younger than his brothers David, Moses and Lot. Their younger sister was Victoria Kamamalu. 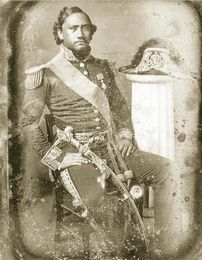 Raised as an adopted child of Kamehameha III, Alexander Liholiho was declared heir-apparent in 1853. As teenagers, he and Lot traveled to the United States, Paris and London accompanied by Dr. Gerritt Judd. His experiences with racial discrimination on the trip helped shape the anti-American, pro-British attitudes and policies of his reign. As Kamehameha IV, Liholiho married Emma Naea Rooke in 1856, having known her since childhood when they had attended the Chiefs’ Childrens’ School together. In 1858, their son Albert Edward Kauikeaouli was born. Despite early missionary inoculations, by mid-century the native Hawaiian population continued to be decimated by foreign disease. Alexander Liholiho celebrated his 16th birthday in Paris. While there, he met President Louis-Napoleon, took fencing lessons and learned to speak French. Kamehameha IV and his wife established Queen's Hospital in 1859 to help stem the tide of sickness. They also helped establish the Anglican Church in Hawai`i, with Kamehameha IV translating the Book of Common Prayer into Hawaiian. Personal tragedy marked the last two years of Kamehameha IV's life. In 1859, in a fit of unfounded jealousy, Kamehameha IV shot his friend and secretary, Henry A. Neilson. Neilson languished for two years before dying. The king's remorse and grief were further compounded when Prince Albert died in 1862. Saddened and suffering from asthma, Kamehameha IV himself died in November 1863 at 29.